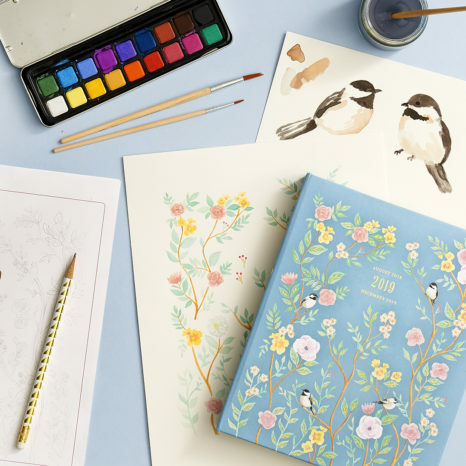 Since our new 2019 planners just launched last week, we thought it would be fun to get a behind the scenes look at how these new designs were brought to life. We chatted with our in-house designers to see what their workspaces are like, how the design process begins, and what possible designs we might be seeing from them in the future! Sometimes a mess! I try to keep it tidy, but when we are busy (as we usually are) my desk will usually be full of sketches, proofs from another project, papers from meetings, and snacks. Messier than it should be, with papers, sketchbooks, and notepads strewn about, which I try to justify by telling myself that messy desks are scientifically proven signs of creative geniuses. It looks messy but I swear I know where everything is…except my keys, I forgot my keys here last week! There’s always about 4 different sketchbooks laying around, loose sheets of tracing paper, multiple mugs filled with pens and pencils, a few watercolor palettes, and various cups of tea or coffee. And always snacks. What tools do you use to design? Almost all of our artwork starts on paper, whether it’s a first initial sketch to get the layout right or a full watercolor painting that is scanned in digitally. All final art is pulled into the computer so we can easily manipulate and send files to vendors, but we also do a good amount of digital illustration straight on the computer. It depends on the design! In general, we start most projects manually so that they have a special, hand-drawn feel. I prefer to sketch things out in pencil first, then outline in pen and clean up the sketch before scanning it into the computer for further rendering. When illustrating geometric patterns, a computer is preferable, as it is more precise. I usually start out with a pencil sketch and then use pens, paint, digital tools, or a combination of those. I usually start out with sketches, then I use various pens. My favorite is the Pitt Artist Pen by Faber Castell. Then I scan and live trace in Illustrator, or tweak in Photoshop. How does inspiration strike? Do you have an inspiration board? As a team, we always meet before big seasons or endeavors like Dated launch and pull inspiration from all over of what ideas we are interested in exploring, what’s on trend, and simply what would make a really fun cover. Individually, we create documents of our inspirations and try to find themes – colors, patterns, objects – and group them accordingly on the page. We then print out our inspiration documents and go over them together, in order to find common themes between all of our inspirations. If several people have something similar, then we know it’s a trend. We split up a design based on who’s most excited to work on it and/or who has an idea of how best to execute it. Inspiration can strike anytime you see something that catches your attention whether it’s online or at an art museum. We create inspiration boards for each season based on things we are liking and how it intersects with current trends. Sometimes I’m inspired by people on the streets – the combination of their outfit colors, or the pattern on a dress. I’m also always scouring blogs and Pinterest for inspiration and trends. Once you get the ideas flowing, how do you focus that inspiration? What has been helpful is separating our inspiration into groups: Color, feeling, style, texture, etc., rather than using an image for direct inspiration. That way you can kind of compile a lot of elements of different images together to get to the general feeling we want to develop. We try to find the similarities in our inspiration as a group and then from there narrow it down into categories. I like to start with a lot of ideas and narrow down to the best, most distinct images that speak to the essence of the idea I’m trying to emulate. Color is probably the most important in setting the mood. A lot of people work with music. What’s on your playlist that gets the creative juices flowing? Whatever is on my Spotify Daily Mix, if that fails Tears for Fears. I’m usually listening to audiobooks or podcasts, but when I do listen to music, it’s one of the curated weekly playlists from Spotify (Discover Weekly, Release Radar). A few of my go-tos are Grimes, Prince, Brian Eno, Kate Bush, Frank Ocean, RuPaul’s podcast, and Fresh Air. I listen more to podcasts than music, but it depends on the project I’m working on. I like to listen to podcasts when I’m working on less creative-intense work like working on production files or building a pattern where I can just zone out and listen. One of my new favorite discoveries is the Getting Curious podcast hosted by Jonathan Van Ness of Queer Eye fame. He is the best! Now that you have the beginnings of a project, how long does it usually take before you end up with a finished project? We work on pretty tight timelines, so once we have an idea started it’s usually within a week or so for art to be finished, then there are always tweaks and edits when it’s reviewed but it’s a pretty quick process to send the files off to the vendor, then we just wait for samples to come in months later. We all work very fast but sometimes we spend weeks making small edits to make sure everything is just right and the overall collection is diverse. It can be anything from a few hours to a few days depending on the design! Most big projects take week to months to develop, because we’re working with the buying and merchandising team in creating a product story. Specifically art development for planners and calendars spans from January until April, so it’s a very big and involved project, so the artwork can really develop and evolve in that span of time. What trends/themes/icons are you currently loving? Bright mustard yellow, velvet, Lucite, pattern on pattern. I’ve been liking 60s-inspired psychedelic floral patterns. I’m also always drawn to abstracts and geometrics done in fresh ways. The greenery trend is still going strong, which I like! Also happy to see the somewhat recent explosion of feminist art. I’m really into the soft pink / mustard / green color trend right now. And I’ll never stop loving anything floral or botanical. What do you think of the new designs? 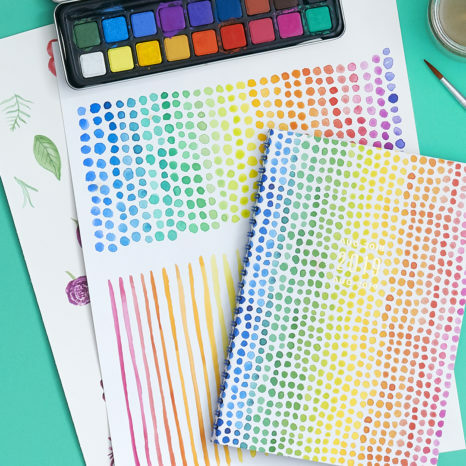 Do you see a planner design that inspires you to make great plans? 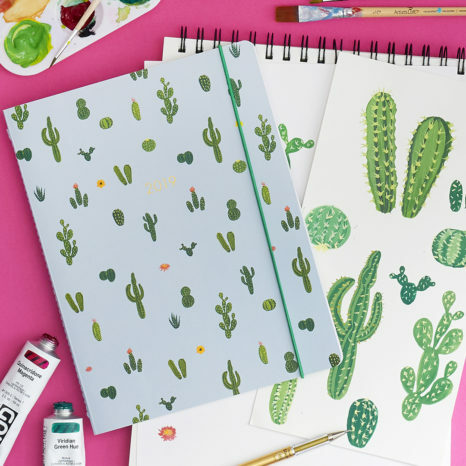 Make sure you check out the full planner collection available at Paper Source. Stay tuned for more features on our favorite designs, and let our collection inspire you to Do Something Creative Every Day!